One number is said to be a factor of another when it (former) completely divides the another number (latter). For example:- If x completely divides y then x is a factor of y. A common factor of two or more numbers is that particular number which divides each of them exactly. For example:- 2 and 4 are common factors of 12 and 16. A highest common factor of two or more numbers is that greatest number which divides each of them exactly. For example:- The HCF of 24 and 32 is 8 because there is no number greater than 8 that divides both 24 and 32. (1) Factorization Method:- First of all find out the prime factors of all numbers of which HCF is to be calculated, then identify all common prime numbers and calculate the product of all common prime numbers, resultant product will be the required H.C.F. Under this method, we follow below steps to obtain H.C.F. Step-1 First of all we divide the larger number by the small number till we get remainder ‘0’ or less than the divisor. Step-2 If we get ‘0’ as remainder then divisor will be H.C.F. otherwise in second step we will divide the divisor by the remainder. Step-3 We have to repeat step ‘2’ till the remainder becomes zero. The last divisor is the required H.C.F. Multiples of a given number are all those numbers which we get after multiplying with any number starting from 1 to. Example:- Multiples of 2 are 4, 6, 8, etc. Common Multiple:- A common multiple of two or more numbers is a number which is completely divisible (without leaving remainder) by each of them. For example:- 60 is a common multiple of 2, 3, 5, 6, 10, 15 and 30 because 60 is exactly divisible by each 2, 3, 5, 6, 10, 15 and 30. Similarly, 36 is a common multiple of 2, 3, 4, 6, 9, 12 and 18. Example:- The L.C.M. of 3 and 10 is 30 as it is exactly divisible by 3 and 10 and below 30 there is no number which is divisible by both 3 and 10. Factorization Method:- First of all find out the factors of all given numbers, then find the product of the highest powers of all the factors that occur in the given numbers. L.C.M. is the product of terms of highest powers of all factors. Division Method:- Arrange the given numbers is a row in any order. Divide by a number which divides exactly at least two of the given numbers and carry forward the numbers which are not divisible. Repeat the above process till no two of the numbers are divisible by the same number except 1. The product of the divisors and the undivided numbers is the required L.C.M. of the given numbers. The product of two numbers = HCF * LCM. 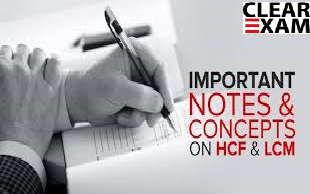 HCF of given numbers always divides LCM. If d is the h.c.f. of two positive integer a and b, then there exist unique integer m and n, such that d=am+bn. Largest number which divides x,y,z to leave same remainder = HCF of y-x, z-y, z-x. Largest number which divides x,y,z to leave remainder R (i.e. same) = HCF of x-R, y-R, z-R.
Largest number which divides x,y,z to leave same remainder a,b,c = HCF of x-a, y-b, z-c. Least number which when divided by x,y,z and leaves a remainder R in each case = ( LCM of x,y,z) + R.